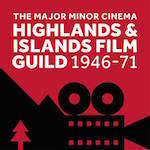 Guild Film Screening in Inverness. Join us at the Eden Court Theatre for an evening of film stories, poetry and song! Scheduled as part of our Inverness case study, this event takes place at 6 p.m. on Friday, 11th November 2016. Enjoy a typical Film Guild programme shown on 16-mm and including the feature film Scott of the Antarctic (Charles Frend, 1948), a newsreel and a cartoon. We will also include some readings of creative writing about memories of cinema-going in the Highlands and Islands. More details at the Inverness Film Festival 2016 programme.